Hawthorne High School welcomed new Principal, Dr. Vanessa Landesfeind to the campus. Dr. Landesfeind left her position as the Principal of Instruction at Dominguez High School in Compton to join the Hawthorne High School team. 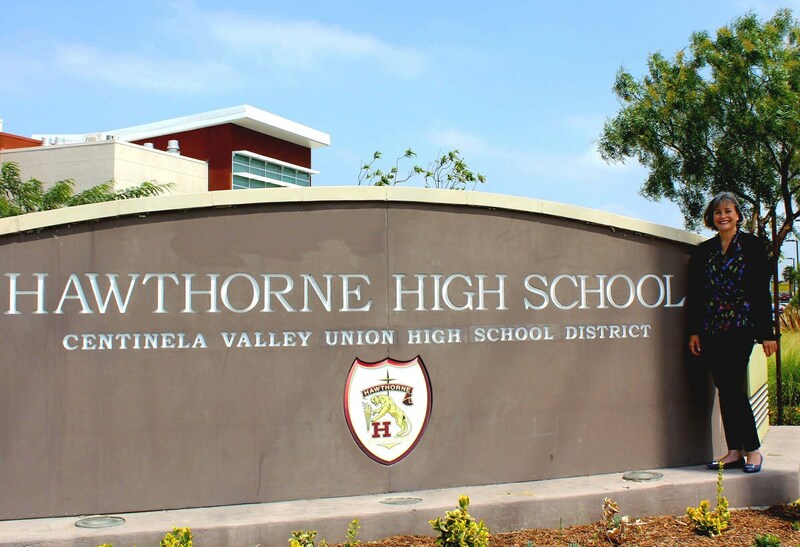 “I am honored to have been selected as the new principal for Hawthorne High School. I look forward to working with our students, parents, staff and community.”, said Dr. Landesfeind. During her tenure at Dominguez she focused on funding and supporting programs to increase college access and preparation. During the last three years in her position, Dominguez was recognized by the University of California, Irvine for having the highest increase in being AVID certified to being eligible to become a demonstration site, produced a national champion MESA team and had an almost 50% increase in its AP Equity and Excellence rating. Dr. Landesfeind completed her Bachelor’s and Master’s degrees at California State University, Long Beach and her Doctorate in Educational Leadership at the University of Southern California. Since 2008, Dr. Landesfeind has also had the privilege of teaching Educational Leadership and the Advanced Studies in the Education and Counseling Departments at CSULB.